Walla! Israeli website, following the latest rocket on Israel yesterday, said that a Salafist group leader in Gaza announced the group will continue with its strikes if Hamas does not halt its crackdown on them, return their weapons and release their detainees which it arrested.Sirens broke out in Israel yesterday at about 9:45 PM in Askalan (Ashkelon) and the areas surrounding it after a rocket was fired from Gaza by the salafist groups. Following the rocket, he ordered striking two sites in Gaza, in addition to the closure of Erez and Karm Abu Salem crossings. The targeted sites were for the Izz Eddin Al-Qassam brigades (Hamas wing). No injuries were reported. Ya’alon said that opening the crossing will take time of assessment, blaming Hamas Islamic resistance movement for the happenings in Gaza. PNN further reports that the group continues to use the people of Gaza as hostages to make Hamas bind to their demands. On Thursday, the group -which is an Islamic State supporter – adopted two strikes on Israel, calling it a response to Hamas’ crackdown on them in the Strip. 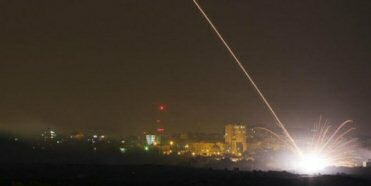 Following the rockets, Israel attacked Gaza with massive explosions using F16 military jets. The Salafists in Gaza, last Tuesday, issued Hamas a 48-hour deadline to stop its crackdown on them, the Associated Press reported. On the same day, Hamas security forces killed an activist of a rival militant group in a shoot-out at his Gaza home, witnesses said. Hamas, which has ruled over Gaza since 2007, has clamped down on radical Islamists after a series of unclaimed bombings, arresting activists and seizing arms. It also mounted occasional crackdowns on rival and more radical Salafist groups that support global holy war endorsed by Islamic State and Al-Qaida.